Everyone in business knows they need to embrace the web, but not everyone knows how to do it or where to start. No matter what industry you're in, the web offers efficiencies and solutions for sales, marketing and customer service, and many other business functions. For businesspeople, small business owners, and marketers, Web Marketing That Works offers proven tactics, road-tested by the authors, and easy-to-use templates for boosting your Google search rankings, using social media to build relationships, developing an effective online marketing strategy, mastering the art of inbound marketing, and much more. Every business, large or small, can benefit from the web. If you're not already using the web to boost your business, you're falling behind the competition. 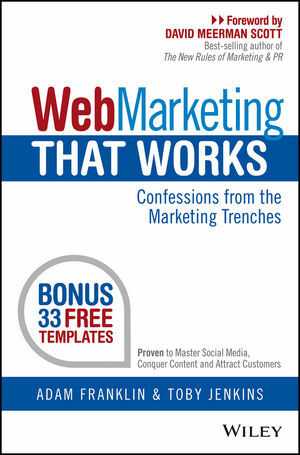 Web Marketing That Works shows you how to get ahead—starting right now. Adam Franklin and Toby Jenkins (SYDNEY, AUSTRALIA) run one of Australia’s top web marketing firms Bluewire Media and have spent more than 10 thousand hours each working on online marketing strategies for themselves and their clients. Having met that brief time and time again the Bluewire boys developed a toolkit of templates that helps clients do exactly that. These templates have been downloaded over 10,000 times and they are continually downloaded by hundreds of people every single week, which highlights that there is a significant demand for the ‘how-to’ skills and tools to actually execute on the web.